The Shire of Mukinbudin has engaged the services of Avon Waste who provide weekly rubbish and fortnightly recycling removal for all townsite lots and fortnightly removal of goods from the recycling bank. Rubbish removal is carried out each Tuesday morning, with bins left on the verge with the handles closest to your house/premises. Bins need to be in place by no later than 6.00am. *Please Note - Your rubbish and recycling services MUST match. Therefore, if you have two rubbish bins you will also be charged for two recycling bins. Please contact the Shire Office on 9047 2100 if you want to amend the number of services you receive. Rubbish removal fees are $165 per year which includes the use of a 240L wheelie bin. Paper, glass and aluminium can be dropped at the recycling bank in Strugnell Street (next to Fire Station). Cardboard can be dropped at Council's Depot on Bent Street. Recycling bins are available for all properties within the Mukinbudin townsite. Avon Waste provide the removal service and this is collected fortnightly. The removal fee is $140 per year. Paper, glass and aluminium can be dropped at the recycling bank on Strugnell Street (next to the Fire Shed & Mukinbudin Steel Fabricators). These bins are emptied during the normal recycling collections by Council's waste collection contractor Avon Waste. 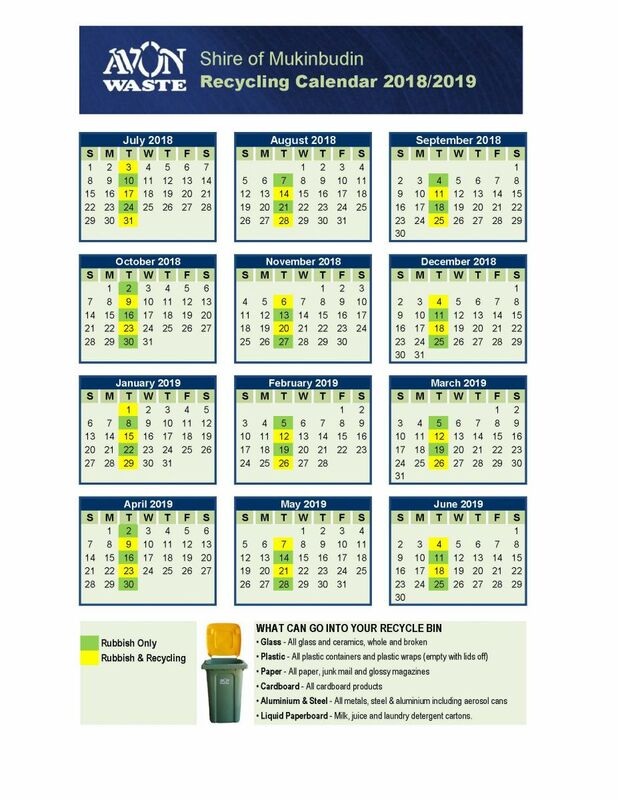 All bins should be placed out for collection by 6.00am on the refuse collection day. Bins should be positioned within one metre of the kerb or edge of bitumen, with the wheels positioned away from the kerb or road. Placement of the bins in any other orientation presents a problem for the lifting equipment and might result in the bin not being emptied. Bins which are split, have broken lid hinges or are otherwise unserviceable need to be repaired or replaced. The contract with Avon Waste provides that they will provide 240L bins for new services and where existing 240L bins become unserviceable. However, where the bin is provided by the contractor the bin will be owned by the contractor. 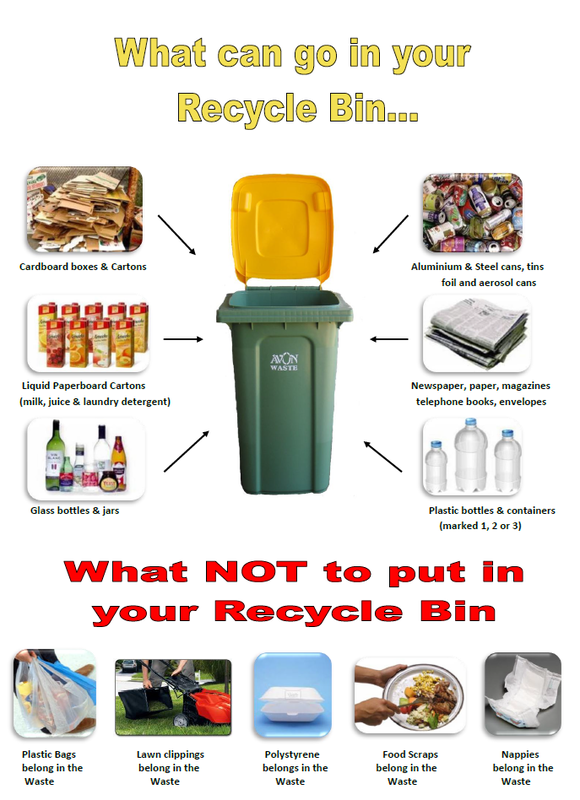 To request a bin to replace a defective bin please contact the Shire on 08 9047 2100. A tank for the receipt of waste motor oil for recycling is located behind the Shire Depot in Mukinbudin. Wren Oil is also collecting oil from farms. For more information please contact the Shire on 08 9047 2100. Conducted in June and December. YES - includes tree and shrub prunings. Please stack branches with cut ends facing the road. YES - includes Bags and Boxes of garden waste, stoves refrigerators (doors removed and degassed) and other white goods.